The First Picture of Us Together, September 1989. 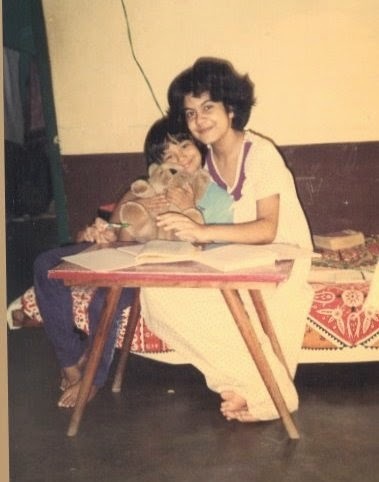 "I still remember the first day you were brought home from the hospital," my sister tells me as we drive from Parkar Parade towards her house, "there was a power cut, and I spent the whole day fanning you." I smile. Our mother had told her repeatedly, that I was the helpless tiny thing and since she was my elder sister, it was her duty to take care me. Words that I think she took to heart. Because even today - my sister refuses to come to terms with the fact that I have turned twenty five. She still thinks I am the baby that was brought from the hospital, and that I belong to her...and anyone who wants anything to do with me, needs her stamp of approval. If you don't have an elder sister, I cannot explain. And if you have an elder sister, I do not need to explain. This was taken during my first trip to Singapore. I have admitted to being positively terrified of being alone with her back then. Because it had been a long time since we'd been alone together. 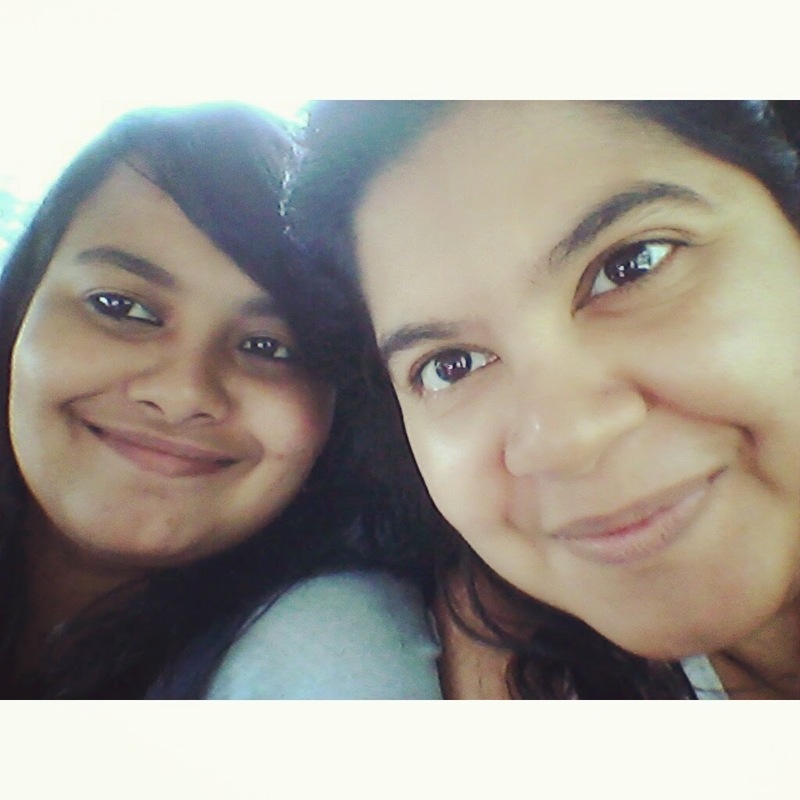 My sister had left home for NUS in 2008, the year I came to Jadavpur University... so the time I was truly turning into an adult, from a schoolgirl - my sister was not around. I have to admit, it was plain annoying, pretending not to understand a lot of things...and keeping a lot of secrets. I used to watch my other friends with stronger bonds with their siblings, sharing almost everything under the Sun with them. "Maybe it's the age difference," a sympathetic friend had once told me, "I am very close to my sister because we are a lot closer to each other's age..."
Those were our ages back then when this photo was taken. And it seemed like a never ending age gap. We had sat around at the dining table, talking nineteen to the dozen, about when she'd be in college I'd still be in school. A school that had decided to label as, "Roopsha's sister" as soon as I'd set foot there. 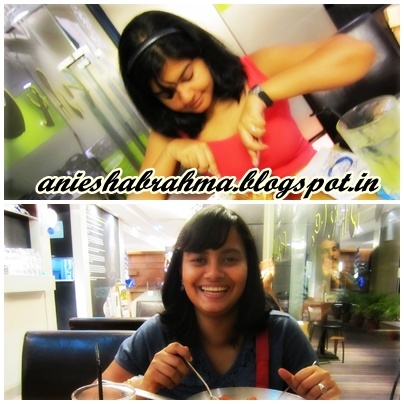 It was not easy being "Roopsha's sister", I tell you. She so good at everything: studies, singing, well-liked, and she has a charm, that makes you want to do whatever she asks you too, no matter how ridiculous you might find her demands. Everyone who has come across my sister has managed to love her, despite stating that she is a Queen and they are all her subjects. If there really exists the art of getting your way - I believe she's mastered it. The only sisterly memory I have attached to that first trip to Pondicherry was when my sister whispered to me in the middle of the night from the upper berth to the next, "Oi! Do you want to have a chocolate?" She even took me out dancing...and here's a bigger improvement, I no longer feel bored in the company of her friends...because no one treats me like a kid anymore. My brother-in-law is a key element for that too... "Aren't you twenty five? Stop acting like a kid!" That's still a little confusing. Since my brother insists on still treating me like a kid...something that keeps bringing us back to being at loggerheads all of the time...and that had once upon a time, seriously stopped me from confiding in my sister. I realized another easy way of making sure my sister treats me like a grownup. I just tell about the new friends I've made, and who are older than I am, but treat me like an adult. Of course - they like indulging me...but they are people, I can safely say things too, without the fear of being snubbed with the obvious, "Well, but you're still just a kid..."
"Ah, but they've met you when you're already an adult. I have known you ever since you were born," she likes to argue. "Don't worry. You're my sister. And I will always you best." I assure her with a laugh. In many ways, I am not sure who's the elder sister and who's the younger one. We both throw tantrums and we both expect the other to pick up the pieces, when everything else seems to fall apart. We fight, we scream, we disagree...but we end up declaring a truce after awhile. It is pretty annoying to be the sister of a woman who is almost always right about things. I trust her judgement. 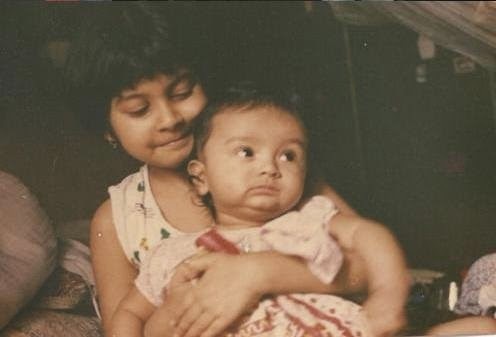 Because all of her predictions have turned out to be true... *grrrrrr* And now that I'm older, I realize that by pretending I'm still her 'baby' sister - she tries to protect me from the world. It's just too bad, that I've already realized how cruel this world can be. But I also discovered the great secret of life: Nothing will ever get you down, unless you let it. Even I one dearest sister. We two are best friends. Sometime we fight also. But still we are friends for ever.